Here is my latest creations, you can find it in my Handmade Artists Shop. This bracelet is truly a one of a kind piece. 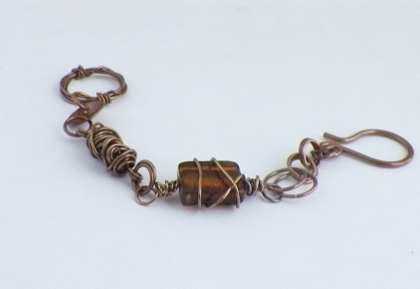 It is made with a brown glass square wrapped with copper on a simple loop, connected to a handmade copper wire wrap, then that is connected to a small copper dome disk, Everything is connected together with hand-cut copper jumprings and finished off with a hand-formed copper hook clasp and that hooks into a copper wire wrapped loop. 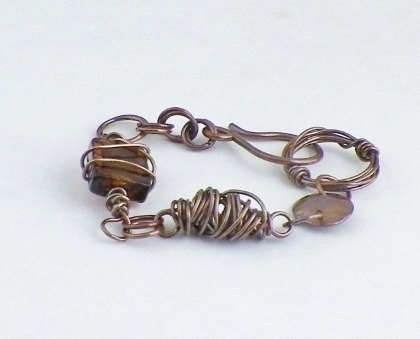 Do you like working with wire? If so what type and gauge do you work with most?